This is why rabbit owners and breeders should become skilled at recognizing the value each rabbit brings to the herd and act upon the knowledge. May is the season when the need to make choices begins to be felt. Which animals are keepers? Which will make excellent pets for someone else? Which animals should enter the food chain? This process is called ‘culling,’ which does not necessarily equate to ‘killing.’ Culling simply means to separate out, and to assign a destination to each youngster, or to any rabbit that has changed status for any reason. At the end of the day, the rabbit farmer is tired but satisfied, the herd is healthy and contented, and trophies line the shelves of some very pleased, happy, and responsible soon-to-be adults, also known as 4H members, FFA participants, or simply, kids. How furry are your rabbit’s feet? Especially those big hind feet? It doesn’t seem to matter WHERE some rabbits live, whether in an all-wire cage, or in your carpeted home. 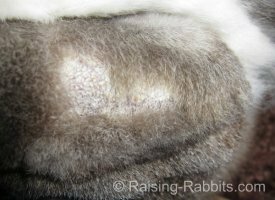 If the foot's fur pads are not thick enough to start with, your rabbit may be prone to developing open sores on the feet, known as sore hocks. Sore hocks are different than calluses on the feet. Calluses (pictured) are bare spots with thickened skin that act just like the tough calluses on your own feet or hands. Some rabbits like to thump their hind legs. In the right circumstances, excessive thumping can damage a callus and create an open, poorly healing sore on top of that callus. Do you have rex or mini-rex rabbits? Flemish Giants or other gigantic rabbit breed? Are you aware if your rabbit’s foot pads are thick or thin? Raising rabbits is popular in Texas! 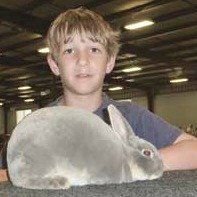 "At the Texas Rabbit Breeders Association (TRBA) annual show in Belton recently, dozens of breeds of rabbit and varieties within those breeds were on display. The people showing rabbits were a diverse lot as well, including young people who raise bunnies for 4-H projects to people who raise rabbits for the meat market. Some exhibitors were from the country and some were from the city, but all were bound by a common interest in rabbits." The City of Los Angeles, CA, has just set up a three-year monopoly of the pet market by the shelter industry. It will soon be illegal in LA to sell any non-shelter/non-'rescued' rabbits, dogs, or cats in pet stores. Los Angelenos have just lost some freedom to choose where their next canine, feline, or lapine pet will come from, unless they spend a small fortune in gas or shipping to obtain an animal of their choice far away from LA. It's an amazing development. The animal rights activists used to despise pet stores. They decried the "impulsive" purchases of cute animals in pet store window boxes. Now they're exploiting this very dynamic - putting spayed and neutered shelter animals with all their inherent health and behavioral problems in those same pet store windows. And when they run out of shelter animals to hawk, what then? They'll thieve them. If current and past history is any indication, legitimate breeders of dogs, cats and rabbits throughout California can look forward to a succession of baseless accusations of cruelty or neglect (and the subsequent legal battles and expenses). Why? So that their animal enterprises can be (illegally) raided, and the animals confiscated, spayed, neutered, and sold -- in pet stores -- to the unsuspecting public. Why? To meet the continuing demand for marketable pets. It's a racket, with the end game occurring when the shelters have no more rescued animals, the last breeder has been litigated out of business, and there are no more pets available for sale or adoption because everything in sight has been spayed or neutered. Call me an alarmist, it's okay. I feel like one. But this is, after all, the avowed goal of PETA, HSUS, and HRS - to end the 'exploitation' of all those poor pets, you know, YOURS, those ones that you so hate and mistreat. If you can deliver sufficient quantities of the anti-inflammatory nutrient, n-acetyl-l-cysteine (NAC) to brains damaged by cerebral palsy, there is now hope of a near-cure, thanks to research in rabbits. This is a fascinating article about immobile rabbit kits born with cerebral palsy, that could move around at "almost normal healthy levels by day five" after treatment, according to Chicago pediatrician Sidhartha Tan. Using rabbits for this study was a logical choice, since both rabbits and humans have only partial brain development at birth. Your friends at Raising-Rabbits.com wish you a wonderful May.